Anomaly detection users can now leverage all the profiling power of Kentik’s Alerts capabilities with their own Custom Dimensions. What this means is that baselining and thresholding are now available on user-defined custom dimensions – like location, service name, customer ID, or any other way you’d like to support meaningfully slicing traffic. A simple use case could be a jump in bits/s for traffic you have classified as “Transit” via custom dimensions. Or a drop in bits/s for traffic you have classified as “Settlement-Free Peering.” Or even major new traffic destinations on a per-application basis. A lot of our anomaly detection users have been asking us to add means to trigger homegrown REST endpoints when alerts are firing, primarily to allow integration to in-house tools and workflow systems. If you are one of these, your voices have been heard! Whether you want to integrate Kentik’s Anomaly Detection capabilities into your existing monitoring systems or trigger your own form of remediation, this is now possible. 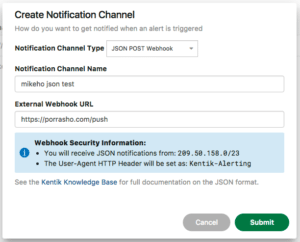 You can now set up a Notification Channel that corresponds to a webhook URL which can be posted to. The Channel will receive all of the relevant JSON data context for you to code against. Route Traffic analysis is the fruit of a hackathon we held earlier this year at Kentik. You may have heard about studies finding it isn’t uncommon for a given network to have over 95% of its traffic delivered by a minuscule number of routes. The reason behind these studies is that the FIB capacity of low-end black box L3 switching gear is limited to around 30K prefixes. If you can find a way to live with only 30K routes in FIB and a default route to cover the rest, you don’t need to purchase very expensive routing gear that has a FIB capacity in the millions of routes. The operational question is which 30K routes? 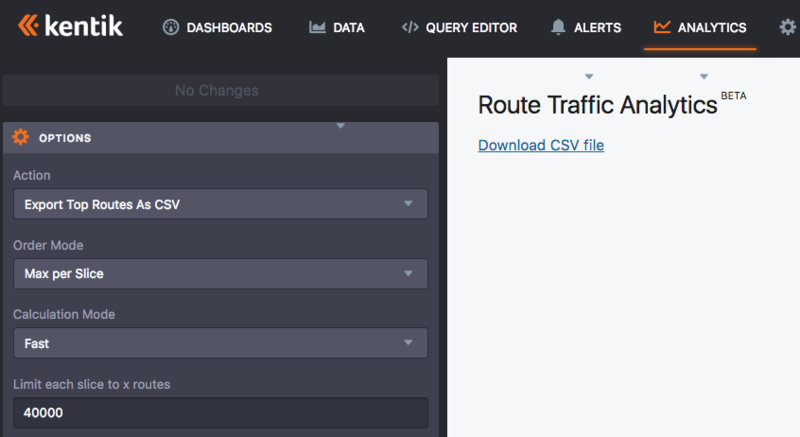 The Route Traffic Analysis feature, under Analysis → Route Traffic, precisely answers this question. 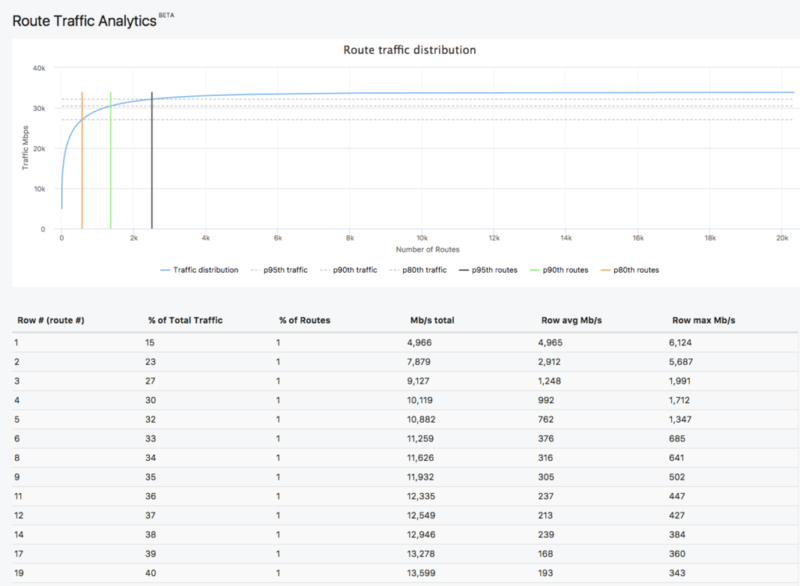 Accessed from the Analytics menu, Route Traffic Analytics feature provides insight into the number and percentage of traffic flows correlated to the number and percentage of routes, plus Mbps per analyzed tranche of routes. The summary view provides both histogram and tabular data views. Conveniently, the histogram on top of the table will display stops for p95th, p90th, p80th for Traffic and Routes on its X and Y axises. In our constant effort to bring more and more dimensions for our users to slice and dice from, we have just added Packet Size and Packet Size_100 grouping dimensions and filters to our Data Explorer and Dashboards. The Packet Size_100 dimension segments packet size statistics in buckets of multiples of 100 Bytes, well suited for Comparison Bar Charts. Interface Capacity has also been added to flow grouping dimensions and filtering in the Data Explorer and Dashboards. 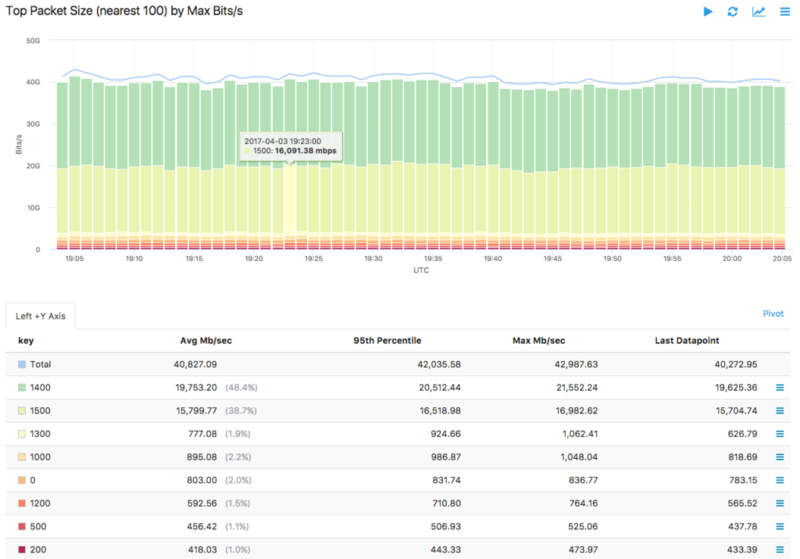 This allows our users to display a graph of all 10Gig links, another of all 20gig links, etc, so customers can eyeball hot links or capacity issues per link type. This capability lets users manually set interface level information that is usually polled via SNMP. Our Knowledge Base entry for Interfaces has been updated with this feature. Providing query-able interface info on a Router/Switch device when SNMP is not enabled. Providing query-able interface info on nProbe hosts as SNMP isn’t available for these by default. The implementation of this feature can be seen in the Device → Interface screen. User Profile settings have been updated to allow enabling or disabling of history, default time-zone and DNS lookups. Settings are in the “User Information” table found by clicking on the username at the upper right of the navigation top bar. Disabling DNS lookups will also reduce query time, as Hostnames for displayed IPs in the Data Explorer query result table won’t have to be fetched before returning the result. Depending on how many IP addresses are being resolved, disabling lookup can greatly speed any graphs or queries returning IP addresses. A newly added option in User Information is the ability to configure a landing page, which is the page that will show by default upon login. The landing page can either be a Dashboard, a Saved View, or your the Alert Summary page if you are a user of our anomaly detection feature-set. We now display distinct flow types for NetFlow v9 and IPFIX on the device listing page. Alerting learning mode default is now +6 days.